Check out the latest David Baddiel book, Birthday Boy! Sam Green really, really, really, really, really, really, really, really, really, really wants it to be his birthday. In fact, Sam wishes it was his birthday every day – literally. His birthday was about to end and then, from his bedroom window, Sam saw a shooting star! 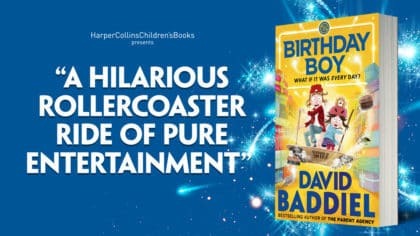 Birthday Boy is the latest book from bestselling author David Baddiel. It’s illustrated by Jim Field, winner of the Roald Dahl Funny Prize!